Calvary Publishing is a ministry of Parker Memorial Baptist Church. 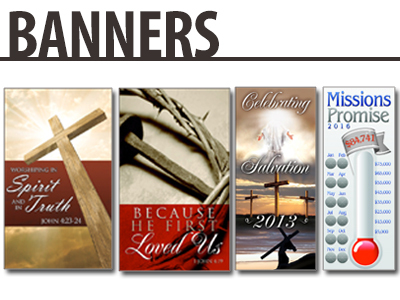 We have been helping Independent, Baptist, Bible-Believing Christians with full color vinyl banner printing since 2003! Working with our professional design team, CP transforms your concept into a top class, professional looking, printed vinyl banner. We offer low prices for printing and design because we are a Local Church ministry with a great desire to help Christians for the glory of God. At CP, our vinyl banners are all printed on a high quality 13 oz scrim vinyl providing an average outdoor lifespan of 3-5 years and an indoor lifespan of 7-10 years. Our banners come standard with a 3/4″ reinforced hem and grommets for hanging. The grommets will be in every corner and then every 2-3 feet depending on the length of the banner. For an additional charge, we can add pole pockets at the top and bottom as well. Contact us today to get started on your vinyl banner project! Use the form below for an instant banner quote: Just insert the width and height of the banner. Compile information you want on the banner. See the samples for ideas. Consider the orientation of your banner: horizontal or vertical. Suggest a color scheme or theme.